On this date in 1912 the passenger liner R.M.S. 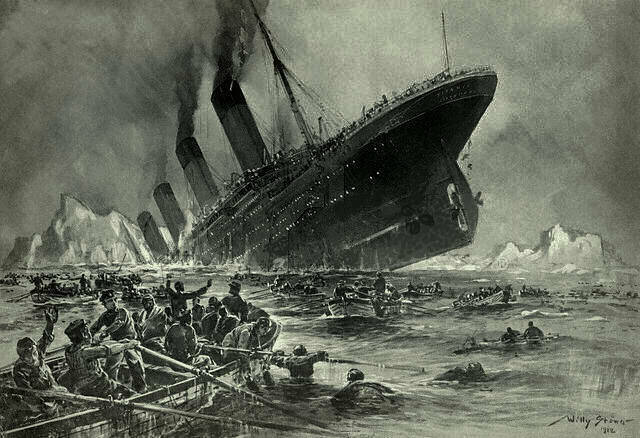 Titanic hit an iceberg in the North Atlantic at 23:40 and sank early the following morning. Certainly the general events of that night are well known through several (fictionalized) movies as well as websites and documentaries, and need not be repeated here. Instead I will focus on the passengers’ last meals, in all classes. Sometimes on this date (particularly on major anniversaries) people like to make a “Titanic dinner.” But they usually focus on the first class menu for the elite. I would like to take a broader view and look at the menus in all classes. 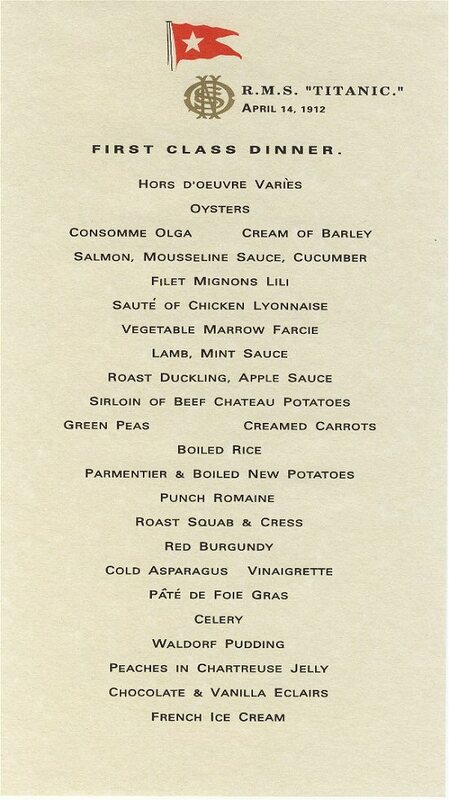 Fortunately, the dinner menus for all classes for the night of 14 April 1912 survive, as do some details of the various dining salons. Before I venture into the foodie aspect of the Titanic, though, I would like to pay tribute to the eight musicians who drowned that night and who valiantly played to calm the passengers as the ship sank. Three of them played that night in the first class dining saloon for the passengers’ last meal aboard. The ship’s eight-member orchestra boarded at Southampton and traveled as second-class passengers. They were not on the payroll of the White Star Line, but were contracted to White Star by the Liverpool firm of C.W. & F.N. Black, who placed musicians on almost all British liners. 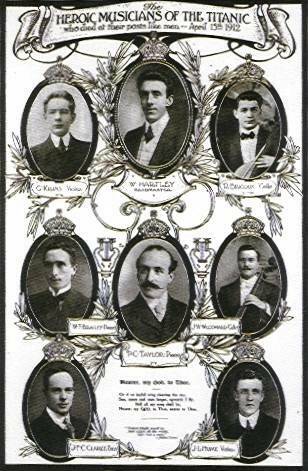 Until the night of the sinking, the orchestra performed as two separate entities: a quintet led by violinist and official bandleader Wallace Hartley, along with John Clarke (double bass), John Hume (violin), Percy Taylor (cello), and John Woodward (cello), that played at teatime, after-dinner concerts, and Sunday services, among other occasions; and the violin, cello, and piano trio of Roger Bricoux, George Krins and Theodore Brailey, that played at the À La Carte Restaurant and the Café Parisien. 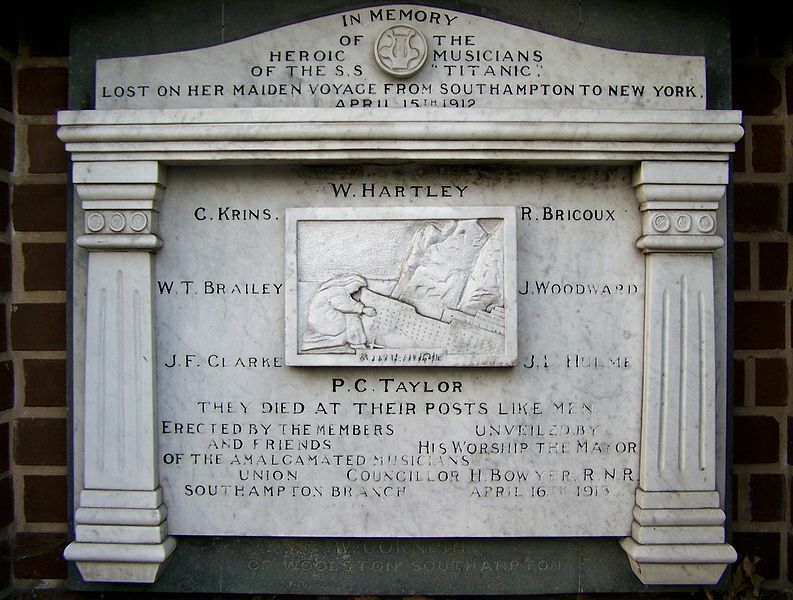 This is their memorial at Southampton. There is no record of the actual recipes but period recipes are not hard to find. The first-class passengers had several dining options but the à la carte saloon is the only one whose details survive. The second- and third-class menus are less often discussed but many of them survive, including those on the fateful night. They are reported in, The Titanic For Dummies by Stephen J. Spignesi. Both classes had separate dining rooms and kitchens with the type of food served based on the class of the ticket. In the third-class dining saloon, located in the Middle (F) deck, diners sat at long tables that could seat 20. They hung their hats, coats, and scarves on hooks attached to the walls. The saloon was large and spare. It could seat 473, which means that two sittings were necessary to accommodate all 710 passengers in third class. 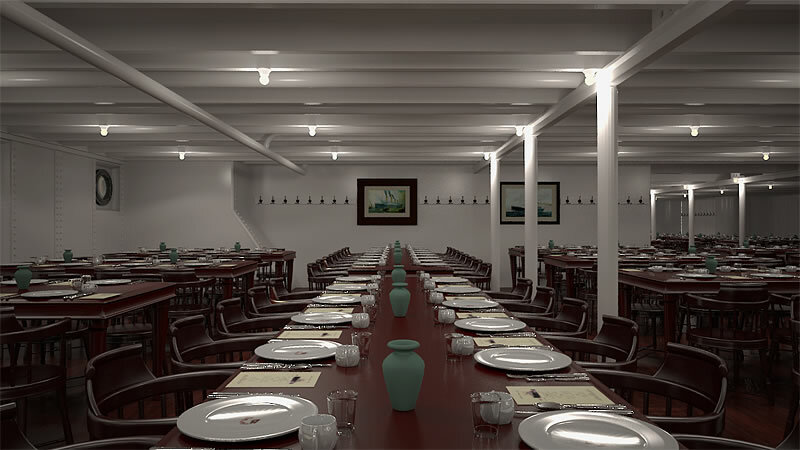 This is a photograph of the third-class dining saloon as recreated by the designers of the replica Titanic II. The food was plain and wholesome with no choices, making it quick to prepare and serve. By good fortune all three menus from 14 April 1912 have survived. I’m pleased to note they had tripe and onions for breakfast. I am also interested to note that this dish was fried rather than prepared in a thickened milk sauce as was usual in England at the time. Being the egalitarian that I am, I am going to give a recipe for rabbit pie. There is no telling exactly how it was prepared but Isabella Beeton can come to the rescue again. Sorry I have no image for you. I do not have an oven. 981. INGREDIENTS.—1 rabbit, a few slices of ham, salt and white pepper to taste, 2 blades of pounded mace, 1/2 teaspoonful of grated nutmeg, a few forcemeat balls, 3 hard-boiled eggs, 1/2 pint of gravy, puff crust. Mode.—Cut up the rabbit (which should be young), remove the breastbone, and bone the legs. Put the rabbit, slices of ham, forcemeat balls, and hard eggs, by turns, in layers, and season each layer with pepper, salt, pounded mace, and grated nutmeg. Pour in about 1/2 pint of water, cover with crust, and bake in a well-heated oven for about 1-1/2 hour. Should the crust acquire too much colour, place a piece of paper over it to prevent its burning. When done, pour in at the top, by means of the hole in the middle of the crust, a little good gravy, which may be made of the breast- and leg-bones of the rabbit and 2 or 3 shank-bones, flavoured with onion, herbs, and spices. Time.—1-1/2 hour. Average cost, from 1s. to 1s. 6d. each. Note.—The liver of the rabbit may be boiled, minced, and mixed with the forcemeat balls, when the flavour is liked.